This is a typical weeknight scene in the old farmhouse kitchen. Due to commutes and varied schedules, the Artist is usually the one manning the stove. There's something to be said for the menfolk preparing dinner. There's even more to be said for the passing of family recipes between fathers and sons. 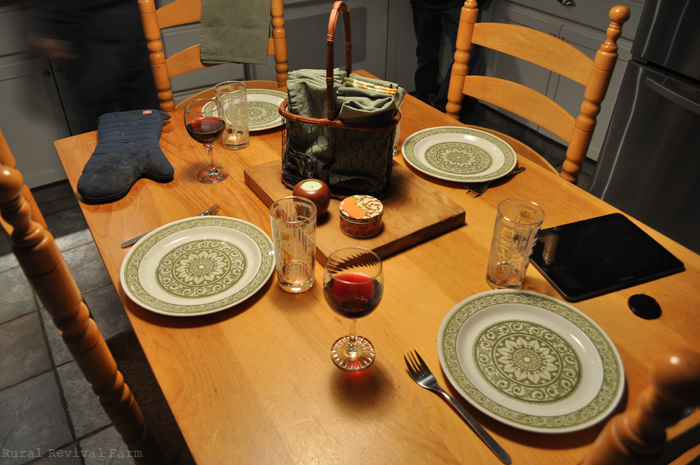 And as I sat and watched and relaxed while dinner was being prepared, I glanced at the butcher's block on our table. A simple piece of wood brought home by the Artist's father. Passing by a church under renovation, he noticed the wooden doors being replaced due to rot along the bottom and asked if he could have a piece. The worker gladly cut him this piece. Unremarkable? Perhaps, except that this particular church is where he married his sweetheart. Not just anyone has a cutting board made from a church door, where they were married no less. And so while he passed down recipes for English style fish and chips, the Artist's favourite 'thin pancakes' with lemon and sugar, or the male twin's constant request of "Stovies" - a hamburger in gravy with veggies over mashed potatoes concoction, (it warms the coldest of tummies on a winter's night), he passed on something less tasty but, oh, so much more meaningful. He taught the importance of family, leaving us not only with warm tummies in winter but the warmest of hearts all through the year, as we attempt to carry on his legacy. Beautiful and meaningful Andrea . . .